INTRODUCTION Finding sources of water on Mars is necessary for future colonists. Studies with orbiting spacecraft have provided a great deal of evidence pointing to where water ice is located. Decades ago, theoretical studies showed that ice could exist under a cover of material that needed to be very thick near the equator, but at higher latitudes could be right under the surface. Instruments onboard the Mars Odyssey measured the depth to this ice layer all over the planet. These measurements closely matched what the early theories had predicted. The Phoenix lander’s rockets blew away a thin cover of dirt to reveal the top of an ice layer. Also, by way of frequent pictures from Phoenix, we watched chunks of ice sublimate into the atmosphere. On Mars today, any exposed ice changes directly into a gas and mixes with the atmosphere in the process called sublimation. View under Phoenix spacecraft Bright regions are probably top of an ice sheet. We also observed this process through HiRISE photos of ice first being exposed in new craters and then disappearing. Thanks to the many satellites going around Mars with advanced instruments, we now have a list of features that are signs of easily obtainable underground ice. The shapes of some landscapes are similar to those on the earth that we know contain ice. Radar studies with the SHAllow RADar instrument (SHARD) on board the Mars Reconnaissance Orbiter ( MRO) have found large deposits of ice under relatively thin layers of debris cover for some of these features . The Compact Reconnaissance Imaging Spectrometer for Mars (CRISM) instrument onboard MRO has been able to detect spectroscopic signs of water in certain landscapes. The ice caps contain vast resovors of ice, but traveling to the poles is a long way to go for this precious resource. This article will display many landscapes that probably contain easily obtained water ice that are much closer than the poles. In early 2018, researchers released information about large amounts of ice found under only a few meters of soil. These places are easily seen as triangular depressions with one steep wall that faces the pole. These exposed ice sheets as thick as 100 meters were discovered by using instruments on board the Mars Reconnaissance Orbiter (MRO). Much evidence of underground ice in vast regions of Mars has already been found by past studies, but this study found that the ice was only covered by a layer of about 1 or 2 meters thick of Martian soil. Shane Byrne, one of the co-authors remarked that future colonists of the Red Planet would be able to gather up ice with just a bucket and shovel. The fact that water-ice makes up the layers was confirmed by Compact Reconnaissance Imaging Spectrometer for Mars (CRISM) on board the Mars Reconnaissance Orbiter (MRO). The spectra gathered by CRISM showed strong signals of water. 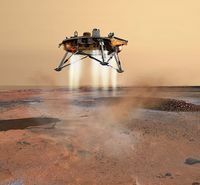 The sites are at latitudes from about 55 to 58 degrees north and south of the equator, suggesting that there is shallow ground ice under roughly a third of the Martian surface. 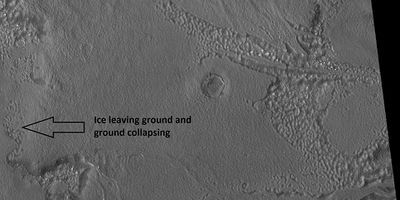 Close view of depression, as seen by HiRISE under HiWish program Arrows indicate where there is a very thin, 1-2 meter covering on what is believed to be ice. 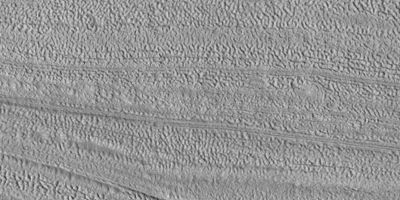 Scalloped ground, as seen by HiRISE under HiWish program. Glacier in Greenland Notice how it resembles the glacier on Mars. Based on current models of the Martian atmosphere, ice should not be stable if exposed at the surface in the mid-Martian latitudes. It is thus thought that most glaciers must be covered with a layer of rubble or dust preventing free transfer of water vapor from the subliming ice into the air. In the recent geological past, the climate of Mars may have been different in order to allow the glaciers to grow stably at these latitudes. This provides good independent evidence that the obliquity (tilt) of Mars has changed significantly in the past. Evidence for past glaciation also appears on the peaks of several Martian volcanoes in the tropics. For a long time there was some doubt about there actually being glaciers on Mars. However, instruments onboard the Mars Reconnaissance Orbiter confirmed the existence of ice below a shallow cover of debris. So far this ice has been found by the SHAllow RADar (SHARAD) in features called lobate debris aprons (LDA) and lineated valley fill (LVF). Ice was found both in the southern hemisphere  and in the northern hemisphere. Researchers at the Niels Bohr Institute concluded that ice in all of the Martian glaciers is equivalent to what could cover the entire surface of Mars with 1.1 meters of ice. In addition to alpine glaciers on Mars, there are other terrains where ice seems to be moving under a few meters of cover. Lineated valley fill (LVF) are lines of ridges in valleys. These lines of ridges are thought to have developed as other glaciers moved down valleys. Concentric crater fill (CCF) contains dozens to hundreds of concentric ridges that are caused by the movements of sometimes hundreds of meter thick accumulations of ice in craters. The concentric ridges could have been made by the movement of ice away from the walls. Based on topography measures of height in these craters and calculations of how deep the craters should be based on their diameters, it is thought that the craters are 80% filled with mostly ice. In other words, these craters hold hundreds of meters of material that probably consists of ice with just a few tens of meters of surface debris. The ice accumulated in the crater from snowfall in previous climates. Concentric crater fill probably develops over many cycles in which snow is deposited, then moves into the crater. Once ice gets inside the crater, shade and a covering of dust preserve it. In time the snow changes to ice. Concentric lines are created by the many separate periods of snow accumulation. Generally snow accumulates whenever the planet’s tilt reaches 35 degrees. This series of drawings illustrates why researchers believe many craters are full of ice-rich material. 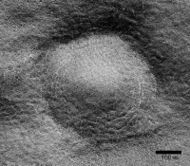 The depth of craters can be predicted based upon the observed diameter. Many craters are almost full, instead of having bowl shape; hence it is believed that they have gained much material since they were formed by impact. Much of the extra material is believed to be ice that fell from the sky as snow or ice-coated dust. Example of a pingo on Earth. On Earth the ice that caused the pingo would melt and fill the fractures with water; on Mars the ice would turn into a gas in the thin Martian atmosphere. Ring-mold craters are a kind of impact crater that looks like the ring molds used in baking. They are believed to be caused by an impact into ice. Ice that is covered by a layer of debris. They are found in parts of Mars that have buried ice. Laboratory experiments confirm that impacts into ice result in a "ring mold shape." They are also bigger than other craters in which an asteroid impacted solid rock. Impacts into ice warm the ice and cause it to flow into the ring mold shape. These craters are common in lobate debris aprons and lineated valley fill. They may be an easy way for future colonists of Mars to find water ice because some may contain ice that is relatively pure. Also, since the ring-mold was created during a rebound, ice may have been brought up from below the surface so much less digging or drilling may be required to gather ice. Note: this is one of the first explanations for ring-mold craters, another has been proposed. Ring-mold craters form when an impacting object goes through a rock layer to reach ice. The rebound forms the ring-mold shape, and then dust and debris settle on the top which serves to insulate the ice. Close view of ring mold crater. Note: this is an enlargement of the previous image of a field of ring mold craters. A pedestal crater is an impact crater which has its ejecta sitting above the surrounding terrain. This forms a raised platform (like a pedestal). These craters are produced when an impact crater ejects material that forms an erosion-resistant layer, thus causing the immediate area to erode more slowly than the rest of the region. Some pedestals have been accurately measured to be hundreds of meters above the surrounding area. This means that hundreds of meters of material were eroded away. The result is that both the crater and its ejecta blanket stand above the surroundings. Pedestal craters were first observed during the Mariner missions. Much of the material under the pedestal crater may be ice. These may be useful for sources of water ice as these craters can be easily spotted from orbit. Pedestal crater, as seen by HiRISE under HiWish program Top layer has protected the lower material from being eroded. Location is Hellas quadrangle, at 52.014° S and 110.651° E (249.349 W). With the increasing resolution of cameras orbiting Mars, we have discovered that many parts of the planet are covered by a smooth coating that in some cases is layered and quite thick. Some parts are eroded, revealing rough surfaces. Some parts possess layers. It’s generally accepted that mantle is ice-rich dust that fell from the sky as snow and ice-coated dust grains during a different climate. Latitude Dependent Mantle and many other supposed ice-rich features occur in two latitude bands in the mid-latitudes; 30-60 degrees North and 30-60 degrees South latitudes. We do not know the exact concentration of ice in the mantle. There may be a little or a lot; maybe the amount varies from place to place. Many places that we believe contain water may require hard drilling to harvest the ice. Perhaps the latitude dependent mantle will not be so hard to extract water from. We know that the mantle does not seem to break up into boulders. Boulders would suggest hard basalt to drill through. Surface showing appearance with and without mantle covering Location is Terra Sirenum in Phaethontis quadrangle. In many places, it seems that the latitude dependent mantle has accumulated to a substantial thickness. 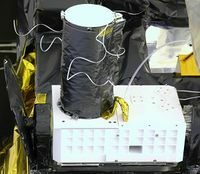 Researchers have called it the “Upper Plains Unit.” This unit can be easily spotted by orbiting satellites by a number of its shapes. Sometimes it displays sets of dipping layers in impact craters, in depressions, and along mesas. It may be 50-100 meters thick, so it may be a source of large amounts of water. This unit also degrades into brain terrain. Brain terrain is a region of maze-like ridges 3–5 meters high. Some ridges may consist of an ice core, so they may be sources of water for future colonists. Close view of upper plains unit breaking down into brain terrain As ice leaves the ground, the ground collapses and winds blow the remaining dust away. Location is Hellas quadrangle. In some places the upper plains unit exists as large fractures and troughs with raised rims; these are called ribbed upper plains. Fractures are believed to have started with small cracks from stresses. Cracks expose more surface area, and consequently more ice in the material sublimates into the planet’s thin atmosphere. Eventually, small cracks become large canyons or troughs. There is one common surface feature that is common to most of these features that contain ice. It is called “brain terrain”. It consists of complex ridges that makes it resemble the outside of the human brain. Wide ridges are called closed-cell brain terrain, and the less common narrow ridges are called open-cell brain terrain. It is thought that the wide closed-cell terrain contains a core of ice, and when the ice disappears the center of the wide ridge collapses to produce the narrow ridges of the open-cell brain terrain. Shadow measurements from HiRISE indicate the ridges are 4-5 meters high. Brain terrain has been observed to form from what has been called an "Upper Plains Unit." Brain Terrain to the right. Box shows the size of a football field. In summary, brain terrain is found on the surface of glaciers, concentric crater fill, lineated valley fill, lobate debris aprons, and the upper plains unit. The closed cell brain terrain probably contains a core of ice. We do not know the size of this core, but having a surface covered by brain terrain is a clue that much more ice may lie below. ↑ Rossbacher, L and S. Judson. 1981. Ground Ice on Mars: Inventory, Distribution, and Resulting Landforms. Icarus: 45, 39-59. ↑ Smith, P., et al. 2009. H2O at the Phoenix Landing Site. Science: 325, 58-61. ↑ Plaut, J., A. Safaeinili, J. Holt, R. Phillips, J. Head, J., R. Seu, N. Putzig, A. Frigeri. 2009. Radar evidence for ice in lobate debris aprons in the mid-northern latitudes of Mars. Geophys. Res. Lett. 36. doi:10.1029/2008GL036379. ↑ Steep Slopes on Mars Reveal Structure of Buried Ice. NASA Press Release. 11 January 2018. ↑ Ice cliffs spotted on Mars. Science News. Paul Voosen. 11 January 2018. ↑ Dundas, E., et al. 2018. Exposed subsurface ice sheets in the martian mid-latitudes. Science. 359. 199. ↑ Colin M. Dundas, et al. Science, 12 January 2018. Vol. 359, Issue 6372, pp. 199-201. ↑ Lefort, A.; Russell, P. S.; Thomas, N.; McEwen, A. S.; Dundas, C. M.; Kirk, R. L. 2009. "Observations of periglacial landforms in Utopia Planitia with the High Resolution Imaging Science Experiment (HiRISE)". Journal of Geophysical Research. 114 (E4). ↑ Morgenstern, A; Hauber, E; Reiss, D; van Gasselt, S; Grosse, G; Schirrmeister, L (2007). "Deposition and degradation of a volatile-rich layer in Utopia Planitia, and implications for climate history on Mars" (PDF). Journal of Geophysical Research: Planets. 112 (E6): E06010. ↑ Zanetti, M.; Hiesinger, H.; Reiss, D.; Hauber, E.; Neukum, G. 2009. 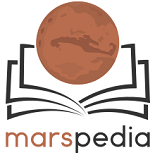 "Scalloped Depression Development on Malea Planum and the Southern Wall of the Hellas Basin, Mars" (PDF). Lunar and Planetary Science. 40. p. 2178, abstract 2178. ↑ Lefort, A.; Russell, P.S. ; Thomas, N. (2010). "Scalloped terrains in the Peneus and Amphitrites Paterae region of Mars as observed by HiRISE". Icarus. 205 (1): 259. ↑ "Lake of frozen water the size of New Mexico found on Mars – NASA". The Register. November 22, 2016 name="NASA-20161122"
↑ Stuurman, C., et al. 2016. SHARAD detection and characterization of subsurface water ice deposits in Utopia Planitia, Mars. Geophysical Research Letters: 43, 9484_9491. ↑ Head, J. W.; et al. (2006). "Extensive valley glacier deposits in the northern mid-latitudes of Mars: Evidence for Late Amazonian obliquity-driven climate change". Earth and Planetary Science Letters. 241 (3): 663–671. ↑ Arfstrom, J and W. Hartmann. 2005. Martian flow features, moraine-like ridges, and gullies: Terrestrial analogs and interrelationships. Icarus 174, 321-335. ↑ Williams, K. E.; et al. (2008). "Stability of mid-latitude snowpacks on Mars". Icarus. 196 (2): 565–577. ↑ Plaut, J.J.; Safaeinili, A.; Holt, J.W. ; Phillips, R.J.; Head, J.W. ; Sue, R.; Putzig, A. (2009). "Frigeri Radar evidence for ice in lobate debris aprons in the mid-northern latitudes of Mars". Geophys. Res. Lett. 36: L02203. ↑ Head, J.; Neukum, G.; Jaumann, R.; Hiesinger, H.; Hauber, E.; Carr, M.; Masson, P.; Foing, B.; et al. (2005). "Tropical to mid-latitude snow and ice accumulation, flow and glaciation on Mars". Nature. 434 (7031): 346–350. ↑ Laskar, Jacques; et al. 2004. "Long term evolution and chaotic diffusion of the insolation quantities of Mars". Icarus. 170 (2): 343–364. ↑ Head, J. W.; et al. 2005. "Tropical to mid-latitude snow and ice accumulation, flow and glaciation on Mars". Nature. 434 (7031): 346–351. ↑ Shean, David E. 2005. "Origin and evolution of a cold-based tropical mountain glacier on Mars: The Pavonis Mons fan-shaped deposit". Journal of Geophysical Research. 110. ↑ Head, James W.; Marchant, David R. (2003). "Cold-based mountain glaciers on Mars: western Arsia Mons". Geology. 31 (7): 641–644. ↑ Plaut, J. et al. 2008. 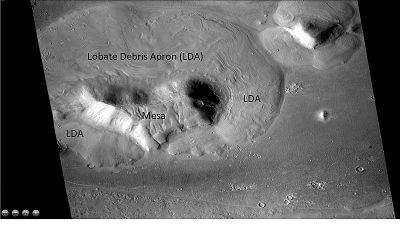 Radar Evidence for Ice in Lobate Debris Aprons in the Mid-Northern Latitudes of Mars. Lunar and Planetary Science XXXIX. 2290. ↑ Holt, J.; Safaeinili, A.; Plaut, J.; Head, J.; Phillips, R.; Seu, R.; Kempf, S.; Choudhary, P.; Young, D.; Putzig, N.; Biccari, D.; Gim, Y. 2008. "Radar sounding evidence for buried glaciers in the southern mid-latitudes of Mars". Science. 322: 1235–1238. ↑ Plaut, J.; Safaeinili, A.; Holt, J.; Phillips, R.; Head, J.; Seu, R.; Putzig, N.; Frigeri, A. (2009). "Radar evidence for ice in lobate debris aprons in the mid-northern latitudes of Mars". Geophys. Res. Lett. 36. ↑ Karlsson, N.; Schmidt, L.; Hvidberg, C. (2015). "Volume of Martian mid-latitude glaciers from radar observations and ice-flow modelling". Geophysical Research Letters. 42: 2627–2633. ↑ Squyres, S. 1978. Martian fretted terrain: Flow of erosional debris. Icarus: 34. 600-613. ↑ Baker, D., et al. 2009. Flow patterns of lobate debris aprons and lineated valley fill north of Ismeniae Fossae, Mars: Evidence for extensive mid-latitude glaciation in the Late Amazonian. Icarus: 207. 186-209. ↑ Garvin, J. et al. 2002. Lunar Planet. Sci: 33. Abstract # 1255. ↑ Levy, J., J. Head, D. Marchant. 2010. Concentric Crater fill in the northern mid-latitudes of Mars: Formation process and relationships to similar landforms of glacial origin. Icarus 2009, 390-404. ↑ Levy, J., J. Head, J. Dickson, C. Fassett, G. Morgan, S. Schon. 2010. Identification of gully debris flow deposits in Protonilus Mensae, Mars: Characterization of a water-bearing, energetic gully-forming process. Earth Planet. Sci. Lett. 294, 368–377. ↑ Garvin, J., S. Sakimoto, J. Frawley. 2003. Craters on Mars: Geometric properties from gridded MOLA topography. In: Sixth International Conference on Mars. July 20–25, 2003, Pasadena, California. Abstract 3277. ↑ Garvin, J. et al. 2002. Global geometric properties of martian impact craters. Lunar Planet. Sci: 33. Abstract # 1255. ↑ Madeleine, J. et al. 2007. Exploring the northern mid-latitude glaciation with a general circulation model. In: Seventh International Conference on Mars. Abstract 3096. ↑ McCauley, John F. (December 1972). "Mariner 9 Evidence for Wind Erosion in the Equatorial and Mid-Latitude Regions of Mars". Journal of Geophysical Research. 78 (20): 4123–4137(JGRHomepage). ↑ Mustard, J., C. Cooper, M. Rifkin. 2001. Evidence for recent climate change on Mars from the identification of youthful near-surface ground ice. Nature 412, 411–414 . ↑ Pollack, J., D. Colburn, F. Flaser, R. Kahn, C. Carson, and D. Pidek. 1979. Properties and effects of dust suspended in the martian atmosphere. J. Geophys. Res. 84, 2929-2945. ↑ Carr, M. 2001. 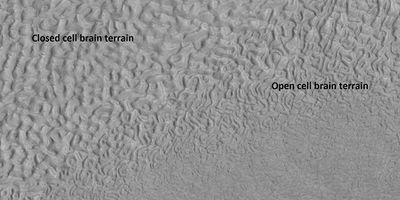 Mars Global Surveyor observations of martian fretted terrain. J. Geophys. Res. 106, 23571-23593. ↑ Levy, J., J. Head, D. Marchant. 2009. Concentric crater fill in Utopia Planitia: History and interaction between glacial “brain terrain” and periglacial mantle processes. Icarus 202, 462–476. ↑ name= Touma J. and J. Wisdom. 1993. The Chaotic Obliquity of Mars. Science 259, 1294-1297. ↑ Laskar, J., A. Correia, M. Gastineau, F. Joutel, B. Levrard, and P. Robutel. 2004. Long term evolution and chaotic diffusion of the insolation quantities of Mars. Icarus 170, 343-364. ↑ Levy, J., J. Head, D. Marchant, D. Kowalewski. 2008. Identification of sublimation-type thermal contraction crack polygons at the proposed NASA Phoenix landing site: Implications for substrate properties and climate-driven morphological evolution. Geophys. Res. Lett. 35. doi:10.1029/2007GL032813. ↑ Levy, J., J. Head, D. Marchant. 2009a. Thermal contraction crack polygons on Mars: Classification, distribution, and climate implications from HiRISE observations. J. Geophys. Res. 114. doi:10.1029/2008JE003273. ↑ Mellon, M., B. Jakosky. 1995. The distribution and behavior of Martian ground ice during past and present epochs. J. Geophys. Res. 100, 11781–11799. ↑ Schorghofer, N., 2007. Dynamics of ice ages on Mars. Nature 449, 192–194. ↑ Madeleine, J., F. Forget, J. Head, B. Levrard, F. Montmessin. 2007. Exploring the northern mid-latitude glaciation with a general circulation model. In: Seventh International Conference on Mars. Abstract 3096. This page was last edited on 5 February 2019, at 12:11.